Activated carbons are manufactured carbonaceous non-hazardous products having a porous structure and a large internal surface area. The chemical structure of activated carbon can be defined as a crude form of graphite with a random or amorphous structure, which is highly porous over a broad range of pore sizes, from visible cracks and crevices to cracks and crevices of molecular dimensions. Activated carbon treatment is primarily based on a phenomenon called adsorption, in which molecules of a liquid or gas are trapped by either an external or internal surface of a solid. The phenomenon is somewhat similar to iron filings being held by a magnet. 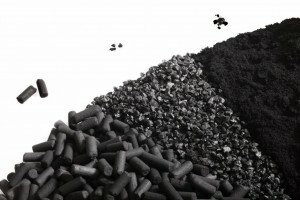 Activated carbon has a very high internal surface area (up to 1500m2/g) and is thus an ideal material for adsorption. To further improve the activated carbon properties for certain applications, we can impregnate the activated carbon with selected chemicals. Contact us for more info on activated carbon!